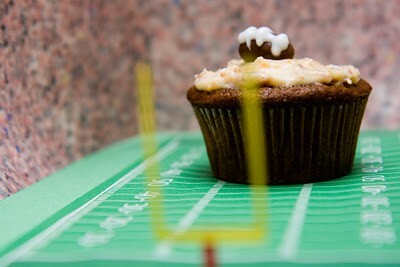 Whether you're hosting or attending a Super Bowl party, these "cupcakes" are a MUST! You'll be voted MVP in no time when you show up with a batch of these treats. If you're looking for other Super Bowl party ideas, Celebrations.com Party Expert Shawn Rabideau put together an article on Super Bowl entertaining ideas -- be sure to check it out & then start planning for your party! It's no surprise that dips always score big points at Super Bowl parties. This collection of winning salsas and dips looks wonderful -- especially the Blue Cheese and Walnut Spread! Check out this football themed children's birthday party -- the details are so fun, and the homemade score board is especially neat. Any little guy would have a blast at this party! This couple put a fun spin on their engagement photo session by honoring their favorite football team. The matching jerseys are great! Have a wonderful weekend and enjoy preparing for next weekend's main event!